Corporations' wealth and power rests on mass consumption. In the past decade, technology outpaced the means of distribution of copyrighted mass-marketed entertainment products. It also enabled the whistle-blowing of WikiLeaks (something I have weighed and criticized). Thus, the Tech Boom brought two concerns to light, which are often conflated: first, people who create artistic and intellectual works own their efforts, and their ownership should reflect in compensation for use of those works, protected by law; second, mass marketing corporate machines, which support artistic production and are middle-men mass distributors, build billion-dollar empires around that first principle, until they become the arbiters of global tastes, desires and values. The evolution of the Web made it plain that huge corporate economies built around ownership of intellectual and artistic property had to evolve to cope with technologies such as file-sharing. Mostly, we think of movie and music studios and big publishers with regard to this issue. But universities equally face challenges from the tech sector as their cachet and publishing houses are no longer the sole means for researchers to appeal to readers and audiences. Some university faculty are working to make their institutions evolve to match global distribution technologies and worldwide demand for research facilities and courses. Others stick close to the bricks and mortar and are following corporate techniques in mass production and marketing to retrench their control over intellectual products and knowledge-driven media. In short, Internet technologies threaten to remove hugely powerful middle-men from the equation, and allow artists and intellectual creators to communicate with consuming publics directly. Corporations could arguably play a constructive role in this evolution, because they are still essential in the finances of production. They might try to find some peace with the unruly patches of the Web, where free information runs like water. For some time, there have been brewing signs of the Web being pitted against the big companies that produce popular movies, music or printed materials. The conflict similarly applies to the leaking of information that reveals how corporations and governments maintain social control and political power strutures. 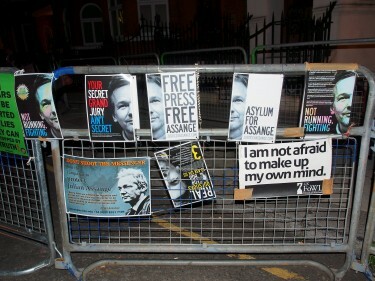 If you have lately followed any aspect of this stand-off - for example, Julian Assange's adventures at the embassy of Ecuador in London - it looks like corporate interests have evolved away from conciliation with Web interests (except in the case of Web entities like Facebook, which creepily took Web freedoms and repurposed them to meet corporate agendas). Corporate evolution is heading in Kim Stanley Robinson's predicted direction. Behind the guise of protecting copyright, there is a remarkable new establishment appearing. Here, personal details are fair game, worth billions to businesses and privacy is a thing of the past. Here, one does not hold the copyright over one's own existence, rather that legal control is delivered via social networks into corporate hands. Peter Chung anticipated the world that will result from Facebook's work in the Aeon Flux episode, "A Last Time for Everything." In this story, the antagonist, Trevor Goodchild, perfects adult cloning by duplicating one of his country's citizens. The man who is the clones' original genetic source confronts the villain, claiming copyright over his personal genetic code: "How about royalties? There's a certain question of property rights involved." Goodchild rages: "Property rights?!" Goodchild has the original test subject physically dragged from his lab by the man's cloned duplicate selves. One suspects that Web anarchists who don't want to pay corporations for the copyrighted material the latter control would be more sympathetic to corporations' demands if citizens' private data were not being delivered wholesale from social networks into corporate marketing money-making machines. There is a double standard at work, and it is enforced by the relative power of large businesses over individuals. When - by virtue of these same copyright principles - one loses copyright over oneself, when one's personal identity becomes an entity one does not own or control, when that identity becomes the property of corporations, what will be the outcome? And what does it mean if that information is used in the marketing of copyrighted materials back to the public? Do members of the public not already have a financial stake in that data? There is also a question of file-sharing as a levelling stopgap against social distress during the Great Recession. The informed middle classes are also called the chattering classes. Their growing literacy constituted historical bright spots in the 18th, 19th and 20th centuries. Literacy and mass entertainment also heralded the 20th century improvement of the working classes; and campaigns to educate workers ensured a vast expansion of the middle classes after World War II. If access to literary, intellectual and cultural materials of all kinds includes shouldering the expenses of legitimately buying access to that information and entertainment, and if that increasingly expensive access is one of the hallmarks of class inclusion, what happens to those in danger of slipping out of the middle classes? It is self-evident that if they cannot afford the data, but can freely gain access to that data in order to cement their crumbling social position, they will do so. A glance at the Twitter feeds on file-sharing reveals the world of the displaced and angry middle classes. Will criminalizing these people for the sake of corporate profits really help corporate interests in the long run? Everyone knows that the gap between rich and poor is widening. Technology can be an equalizer and bridge that gap; it can also make things worse. It's called corporate fascism. Corporations have more rights than people now. Corporations are "people" don't you know ? If you stand in the way of profits then you are expendable. The Nazi gassed people in their final solution and made their skin into lamp shades, their hair into mattress stuffing, stole and melted down the gold from their fillings, took their cloths and belongings to be resold and made their bones and teeth into concrete and back fill. If you let them they will do the same to you because after all when power is allowed to concentrate it always results in crimes against humanity and history is the proof of it. we're heading there fast. have you noticed the police uniform is paramilitary these days? the law should be changed globaly so that a company cannot be classed at a citizen. if it cannot vote in a general election, it should not be classed as a person. don't give them any ideas. giving them the vote is the last thing we need. It's amazing what private citizens like those people from FACT and MPAA can get done with a little social engineering... That means I can do the exact same thing... oh, wait. This could be solved so easily. Just give people what they want, when they want it and at a reasonable price and most of the piracy concerns will simply go away. There are people that will always consume pirated content but the majority of the population would go for convenience every time. iTunes has already proven that. You simply cannot sue your customers into the ground and expect to survive in the long run. As a starting point look at the top 10 pirated content web sites and see what people are paying. Then increase the price by 10% and make the content available to any and all platforms (iOS, Mac OS, Windows, Android, Playstation, Xbox etc, iTunes, Amazon...). There will be some pain in the short term but trust me. Once you have people hooked they will be happy to pay for the convenience of not having to search the web for content. Hulu to some extend has already shown that there is a market for this. Now imagine a place where you can get any TV show, movie, etc ever produced. Imagine it being available at the same time anywhere on the planet. Imagine it costing 8 cents per minute. Maybe 10 cents per minute for premium content. Is that really so hard to imagine? Isn't there another way to address the fact that technology has outpaced conventional modes of marketing, distribution and sales? How much marketing is necessary when we are undergoing a communications revolution? It makes me wonder what portion of the high cost of copyrighted products covers marketing strategies and advertising. For all the troubling problems with Web anarchy - and there are many, ranging from copyright illegality, to a lawless culture of false entitlement, to outright treason - governments blindly enforce the demands of corporations against the free Web at their peril. As Robinson predicted, state officials may find that, like their citizens, they and their nation-states will be only smaller players in this great power game.